​Dr. Pradeep Ullal is the spiritual head of Kevala Foundation. He is one of the rare Himalayan yogis serving in urban world, and truly empowered to awaken the kundalini shakti through the relay of shaktipat. He is respected as a Super Gamma Master with ability to raise his brain frequency to 100 Hz and transmit bio-photonic energy transmissions of compassion. 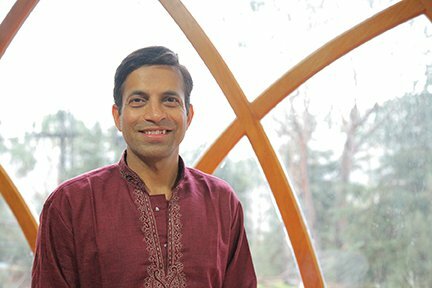 He also combines his rich experiences, gifts and techniques in path of Kundalini, Samaya Tantra, Nada, Laya, Kriya, Surya, Jnana and Raja Yoga to inspire, empower and awaken aspirants. Dr. Pradeep Ullal is the founder and spiritual head of Kevala Foundation at Chikmagalur in India. He is also the founder of Kevala Celebration Centre which will serve as a hub for exploring, experience and elevating through the subtle journey of yoga, veda, ayurveda, tantra, art, music, dance, meditation, healing and serving. He inspires audiences across the world through his high vibrancy workshops, shaktipat transmissions, discourses, satsangs and seminars. Dr Pradeep has initiated over 5000 aspirants from over 120 countries through his gamma waves transmissions. He is celebrated as a powerful Himalayan yogi, clair-cognisant and healer who effectively channels intent, touch, sound, breath, light to sustain higher vibrancy and natural healing. His research on body work includes traditional yogic massage. His athletic abilities at 45, boyish charm, child like enthusiasm, joyful and balanced living has inspired many. Adept at several disciplines like martial arts and passionate about art, culture, people, and research, he was awarded PhD from Washington International University for his thesis on ill-effects of sedentary lifestyle and ways to overcome it. He has coached thousands of people across the world on the path of self-realization. Meditating with Dr. Pradeep is a divine experience of deep stillness and silence. His mere presence has enabled many to be inspired on the path of ascension of awareness. His greatest contributions are his creative ability to raise vibrancy in practitioners through simple and effective methods. He has evolved Sampoorna Shakti Sadhana, regarded by thousands of worldwide practitioners as most effective to cleanse, purify the body, breath, mind and karmic resistances. Dr. Pradeep Ullal conducts free workshops for rural poor and aims to reach out to many more through his charity trust initiatives at Chikmagalur in India.